Out of the four variants, two engine and transmission options, which one is the right fit for you? 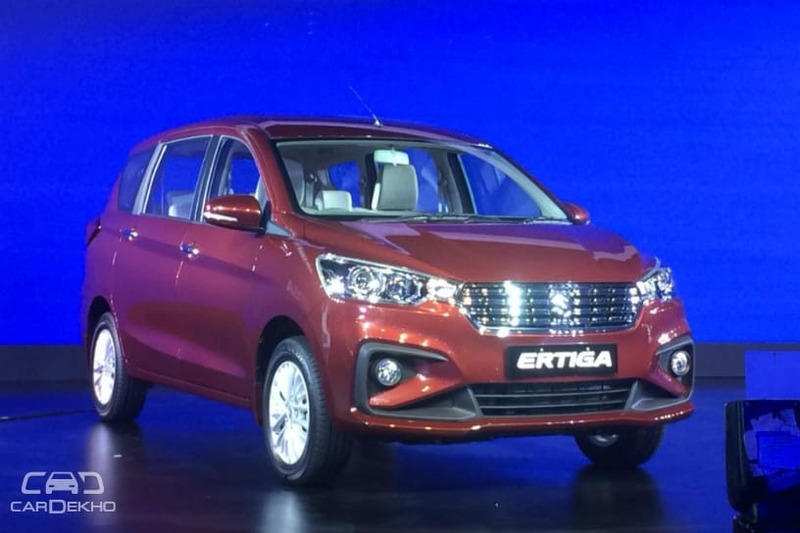 The Maruti Ertiga has been launched in India at prices ranging from Rs 7.44 lakh to Rs 10.90 lakh (ex-showroom India). Maruti offers a choice of four variants for both petrol and diesel engine options. While a 5-speed manual transmission is standard, the 2018 Ertiga can also be had with a 4-speed AT (torque converter) on the petrol variants. So which feature package, engine and transmission combination suits your needs better? Let’s find out. Exteriors: Projector halogen headlamps, 3D LED taillamps, black front grille and 15-inch steel wheels. Interiors: Dual-tone interiors, second and third row split and recline, adjustable headrests in all three rows, driver sunvisor with ticket holder, 4.2-inch MID with coloured TFT (petrol only), tachometer, gear shift indicator, digital clock, door ajar, headlamp warning and instantaneous fuel consumption readout. Despite being the base variant, the LXi/LDi covers more than the basics, offering features such as AC, power windows and even cooled cup holders. It misses out on an audio system, but you can get it as an aftermarket add-on from Maruti genuine accessories for as little as Rs 6,300 for the head unit and four speakers starting at around Rs 1,200. So, if you are short on budget, we recommend you go for this variant as it doesn’t skimp out on safety features at all either. Exterior: Chrome front grille, full wheel caps, body-coloured door handles and electrically adjustable and foldable ORVMs with integrated turn indicators. Interior: Second row armrest, split type luggage board, chrome tip on hand brake and gear lever and passenger side sunvisor with vanity mirror. Convenience: Second row adjustable armrest, remote keyless entry, accessory socket with smartphone storage. Audio: 2-DIN audio system with Bluetooth, USB, AUX connectivity, four speakers with steering-mounted controls. The premium that Vxi/VDi manual variants command over respective L variants is pretty steep. It does look upmarket from the outside and with the armrests for the second row, this variant makes even more sense for the chauffeur driven. It even gets a decent audio system with all the necessary connectivity options, but fails to justify the Rs 72,000 premium. That said, this is the most affordable variant with automatic transmission but you’ll have to shell out an extra Rs 1.02 lakh for it over the manual variant. Exteriors: Alloy wheels, chrome on door handles and tailgate garnish, rear wiper and washer. Convenience: Push-button start/stop, auto climate control, rear defogger and accessory socket for third row. Safety: Front seatbelt height adjuster and fog lamps. Apart from features like height adjustable driver seat, rear washer, wiper and defogger with fog lamps, other features here are either cosmetic enhancements or want based. But, this variant offers driver seat height adjustment which comes in handy if you aren’t of average build. It might be on the expensive side for a premium of Rs 83,000 over the V variant, but gets features which should enhance your ownership experience in the long run. The only notable feature it misses out on is the touchscreen which is present on the next variant. And if you are spending as much, why not just go for the top variant which costs Rs 51,000 more. That said, this is the top variant to get an automatic transmission which attracts a premium of Rs 96,000 over the respective manual variant. So if you can’t do without the convenience of an automatic transmission and don't mind spending the extra cash, we recommend going for this one over the VXi. Interiors: Leather wrapped steering wheel with wooden finish. The Z+ variant is the only one to get the touchscreen with rear parking camera as standard but for an extra cost of Rs 51,000. It also gets an upmarket steering wheel. If you can afford it and don’t need an automatic transmission, then it is the future proof Z+ variant that you should go for.